• You must prime the inhaler before you use it for the first time. To prime the inhaler, shake it well for 5 seconds, then pump 1 test spray into the air away from your face. Repeat this 3 more times to be sure the inhaler is fully primed. • You will need to reprime the inhaler if you drop it or if you have not used it in more than 4 weeks. To reprime the inhaler, shake it well for 5 seconds, then pump 1 test spray into the air away from your face. Repeat this step 1 more time to be sure the inhaler is fully primed. • Place the mouthpiece between your lips and try to rest your tongue flat, unless your doctor has told you otherwise. Your doctor may have told you to hold the inhaler 1 or 2 inches (2 or 3 centimeters) away from your open mouth or to use a special spacing device. As you start to take a slow deep breath, press the canister and mouthpiece together at exactly the same time. This will release a dose of Flonase Inhaler. Continue breathing in slowly and deeply and hold for as long as comfortable, then breathe out slowly through pursed lips or your nose. If you are using more than 1 inhalation, wait about 30 seconds. Shake the inhaler again and repeat the above steps. Keep the spray away from your eyes. 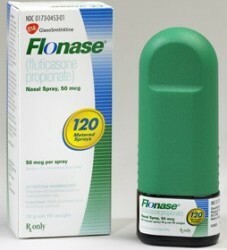 • Using Flonase at the same time each day will help you remember to use it.